The DUA were present all day at the Freshers’ Fair in the Students’ Union on Thursday. 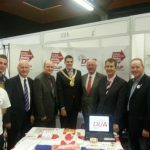 We received a fantastic response from students at our stall, with record numbers of freshers and continuing students joining the Democratic Unionist Association. 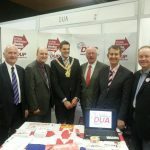 The Lord Mayor of Belfast, a number of MLA’s and several party representatives joined us for what was a very successful afternoon. We would like to thank all those who managed to stop and talk to us, and we will soon be in touch about our first event of the year.